Tracing roots to Vedic times, the rich heritage of Himachal Pradesh did find safe retreats from frequent invasions in Himalayan valleys, at isolated kingdoms and at remote habitations. The mighty mountains have always been counted upon as life-giving, where the seeker found shelter and solace. Mystical practices of primitive Shamanism have peacefully existed alongside the evolved faiths of Hinduism, Buddhism and Jainism for thousands of years. 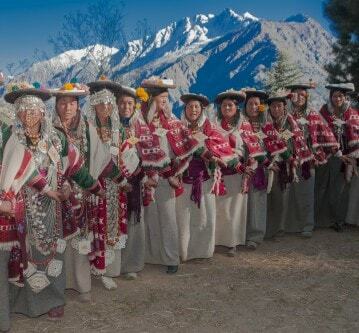 Living in a challenging mountainous terrain created art forms, architecture styles, music beats, dress styles, agricultural cycles and belief systems that owe much to the Himalayan ecosystem blessed with a temperate climate. Sun rising over the mountain, worshipped as Surya, was considered the most vitalizing force against cold winter days. Life in villages centered around temples of Devi and Devta (gods and goddesses), with a shaman in trance often being the adjudicator of good and evil in society. Animated art forms have survived in temple architecture, wood carvings, metal and stone crafts, monasteries, wall paintings, murals, miniature paintings, forts and palaces. 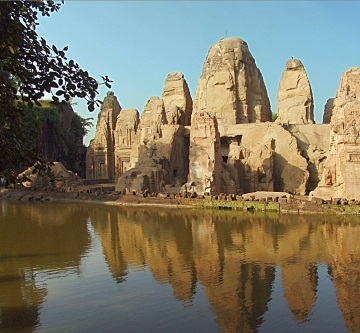 The Masroor Temple in Kangra, a rare monolithic rock-cut temples in North India, is an ambitious feat comparable with the rock hewn shrines of Ajanta and Ellora in Western India. The delicate stone chiselling at the pyramidal Vishweshwar Mahadev temple at Bajuara in Kullu, the aesthetically sculpted Shiva temple at Baijnath in Kangra and the Laxmi Narayan temple complex at Brahmaur in Chamba have left behind a timeless stamp of exquisite craftsmanship on the land. Old abandoned forts breathe about a tumultuous past. Thousand year monasteries, chanting peace prayers, are a living tradition. Buddhist monastery of Tabo in Spiti, founded in 996 AD, with its fine wall-paintings and stucco statues in an arid land is a timeless treasure. The Kangra Fort, Nurpur Fort, Naggar Castle, Kamru Fort, Sujanpur Tihra Fort, Padam Palace at Rampur, Jubbal Palace, Arki Palace and others are repositories of the lands rich past. Time at Pragpur, a heritage village, comes to a standstill. Life size metal statues of Lord Ganesh, Nandi – the sacred bull of Lord Shiva, Goddess Durga as Lakshana Devi and Adi Shakti Devi from the 7th century in the temples at Bharmaur exhibit the metal casting skills that the craftsman had achieved. Sacred Thangka paintings, patronized by monasteries, or the miniature masterpieces from the Pahari schools of paintings from Kangra valley do bring out the influence that the mountains cast on the artists. Drum beat rhythms of the local bands with no accompanying stringed instruments capture sounds of storm, thunder and fast flowing streams flowing over rock and boulders. The dress and cuisine is as varied as the land. Temple craft freezes the belief systems, paintings record the age lived and colonial mansions speak of an age of leisure and opulence. The grey-stone Viceregal Lodge housing the Indian Institute of Advanced Study, the neo-Gothic structures of Gaiety Theatre, Accountant General’s Office, Railway Board’s Building, Raj Bhawan at Barnes Court at Shimla are among the country’s finest heritages of British-colonial architecture. The Kalka – Shimla rail track, an engineering marvel, is a UNESCO mountain railways of India World Heritage site. Not just peaks, all the rivers, most lakes, many grooves and some trees are held sacred. From a deeply embedded consciousness they are part of the natural heritage over which different strands of societal cultures have evolved. Sensitive to the environment, much effort has been taken to conserve our natural heritage. Many Parks, Sanctuaries and Reserves have been marked out for conservation. The Great Himalayan National Park, in Parvati valley of Kullu, is possibly the last refuge for undisturbed western Himalayan flora and fauna, something which even UNESCO has recognized as a natural World Heritage Site.